Evening view of Burj Khalifa tower the world's tallest structure and skyline in Dubai, UAE. 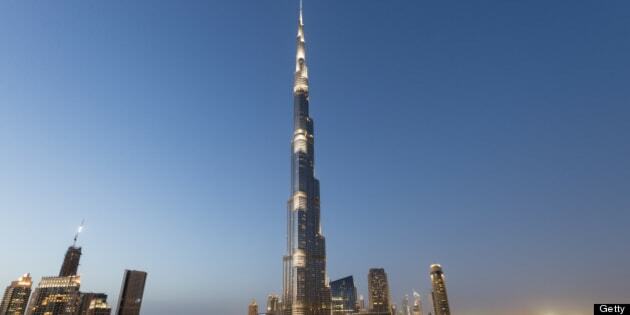 An Arab magician says he wants to make the world's tallest building vanish, reports Arabian Business. "I can make the Burj Khalifa disappear for three seconds," Montaser Al Mansouri, a magician based in the United Arab Emirates, told XPRESS. But Al Mansouri isn't your average performer and has the credentials to back up his ambitious claims: he's won the Oscars of magic, as he calls them. In 2012, and again in 2013, the 42-year-old based in UAE capital Abu Dhabi became the first Arab national to win two Merlin awards, Gulf News reports. The awards are "presented to those magicians who have achieved the highest level in their craft, both on the national and international stage," according to the U.S.-based International Magician's Society. Other winners of the award include Penn and Teller, David Copperfield and Criss Angel, but the society's chairman says not all winners are famous. “We look for showmanship, skills and talent, and so it’s an award that the magician has to work hard for," Tony Hassini, chairman and chief executive of the International Magicians Society, told The National. "The idea is to be persistent, and stay with it and get it,” he said. Al Mansouri won the prestigious awards for performing more than 70,000 shows over 25 years — an average of six shows a day, the paper reports. He performs daily at the Emirates Zoo in Abu Dhabi.